Minford’s Eli Cordle attempts to control the ball in a Thursday evening matchup against Northwest. Northwest’s Evan Throckmorton advances with the ball while Minford’s Elijah Craft trails the play. 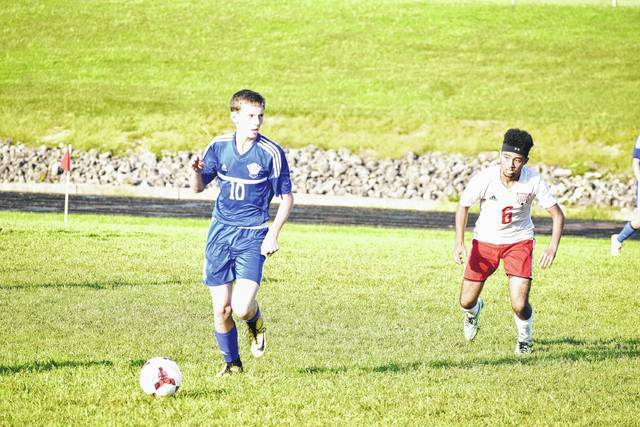 MINFORD — Over the course of the 2017 season, the Northwest Mohawks’ boys soccer program has rolled through each of the opponents that it has faced en route to an undefeated mark. On Thursday evening, however, the Minford Falcons were determined to not allow Northwest to roll to a rout, as nine of the Mohawks’ previous 10 affairs had been. And over the duration of the 80-minute SOC II conference affair on Thursday evening, the fans that attended the contest on both sides weren’t disappointed, especially over a 17-minute span where both teams combined for all five of the goals scored in the contest between the 15th and the 32nd minute of the contest. Ultimately, however, Northwest proved why the Mohawks are, indeed, the newest power unit in the SOC II ranks as of the present day as Northwest used two early Tyler Webb goals, along with a game-winning rebound blast from Harald Rundquist, to pull out a 3-2 victory over a strong effort from Minford in the heart of Muletown. 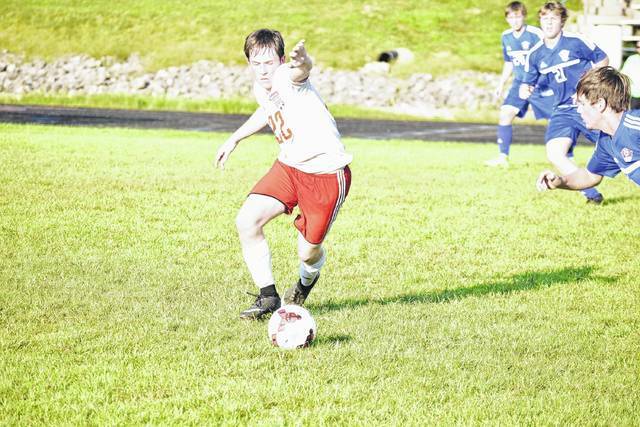 For Josh Keeney, the effort from his boys was, indeed, impressive, not only considering how well-coached and talented Minford is, but how hard it is for any opponent to beat the Falcons on their home turf. As for Dave Gampp, Minford’s effort in the contest was certainly nothing to be ashamed, especially considering that the Falcons arguably gave an undefeated and untied Northwest squad its toughest match of the year. Throughout the affair, both teams’ efforts showed as each unit took their turns making successful pushes up the field. However, other than a pair of shots by Evan Throckmorton and Rundquist — which missed high and wide by inches, respectively — neither team could crack the code against the opposing unit’s backline. That, however, all changed in the 15th minute, when Tyler Webb got loose again on the near side. The junior took a strong pass off of a through ball and connected on the near side to put Northwest up by a 1-0 tally. Less than two minutes later, it proved to be rinse, repeat for the Mohawks as Webb, again, took an excellent through ball from Rundquist and struck from the right side of the box to put Northwest up by a 2-0 tally. Gampp, admirably, took blame for allowing the two goals to occur in the first place. However, to the credit of Gampp and the Falcons, Minford, despite facing an 2-0 deficit with 63 minutes left to play, never showed signs of quitting. In fact, the Falcons, during the latter half of the opening stanza, even looked like the better unit at times, as Minford was able to create runs offensively despite dropping a player back to its backline. Ultimately, Minford’s effort and poise against a deep, experienced, and talented Northwest squad paid off in the form of Talen Coriell, who proved to be his usual excellent self on Thursday evening. After an offsides call negated a Minford goal, Coriell came back and struck less than 15 seconds later by pounding a through ball home on the far side of the box in the 28th minute. Two minutes later, Coriell struck again as the junior scored again on a free kick from 15 yards away on the near side of the field to turn a 2-0 deficit into a tie game in a matter of 120 seconds — all despite dealing with a sinus infection that could have possibly kept the junior out of Thursday’s contest. However, Rundquist’s relentless effort proved to be the winning elexor that Northwest needed. Two minutes after Coriell’s blast, the Mohawks obtained an offensive opportunity from Throckmorton, who shot a blast from the far side of the box. While the shot was saved in impressive fashion by Logan Boston, Rundquist raced to the near side of the box, beat Boston to the rebound, and pounded a goal home to the far side of the net to give the Mohawks the lead for good. As with Coriell, Rundquist, one of Northwest’s main figures in the splendid and blistering 11-0 start to the 2017 season, played under the weather, as well. The offensive standout was throwing up before the game and at halftime of the affair between the two rivals. In the second half, Minford and Northwest took their turns in making runs at the opposing backlines. While Minford held the potent Mohawks’ offensive unit scoreless in the second half, the relentless efforts of Mason Campbell, Chase McClay, and Austin Speer kept Minford from obtaining a clean look at the net as the trio hounded the Falcons’ strong offensive combinations throughout the final stanza of action. With the win, Northwest not only has kept itself in a position to be ranked or receiving votes inside the OSSCA banner, but has put itself in a position to control its own destiny inside the SOC II race. The Mohawks, who are now 5-0 in conference play and 11-0 overall, will play West next Tuesday at 5:30 p.m. and follow that match up with a pair of bouts against Waverly (Sept. 28, home, 5 p.m.) and Wheelersburg (Oct. 3, away, 5 p.m.). Those matches are all that stands between Northwest and an SOC II crown. As for Minford, the light certainly can’t be turned off on the Falcons by any means. In fact, after going 2-4-1 to start the 2017 season, the Falcons had defeated Waverly, Westfall, and Fairland by a combined score of 13-1 to move to 5-4-1 before the tight loss to the highly regarded Mohawks on Thursday — which means that Minford could be soaring at the right time.